Piezoelectric energy is nothing new, but researchers at Princeton University have developed a new type of electricity-harvesting rubber sheet that has the potential to change the way we power electronic devices. 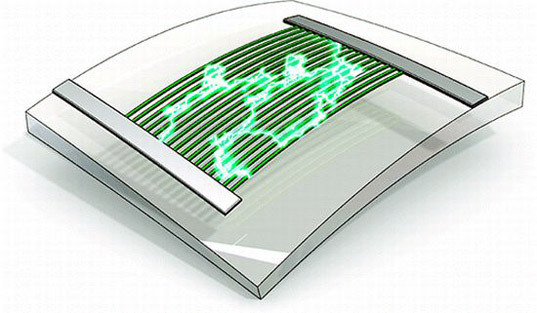 The flexible rubber sheets are imbued with piezoelectric ribbons and are durable, versatile, and open up exciting new applications for harvesting kinetic energy. The so-called “piezoelectric ribbons” are made up of organic lead zirconate titanate nanoribbons placed on silicone rubber sheets. When the sheets flex, they generate electricity by turning mechanical energy into electrical energy. As you might imagine, there are unlimited applications for the technology — shoes that harvest energy from movement to power gadgets, movement-powered microsurgical devices, and even pacemakers that are lined with the material instead of relying on traditional batteries are just a few examples of potential uses. No word on when the piezoelectric ribbons will be ready for prime-time, but the researchers involved are already trying to scale up the rubber device to make it commercially viable. Once that happens, there’s no telling how many gadgets powered by traditional batteries can switch over to the long-lasting, energy generating rubber sheets.